Check this latest Skyjet seat sale for Batanes, Boracay, Coron and Siargao! Visit the sought-after Philippine destinations of BATANES, BORACAY, BUSUANGA and SIARGAO with less expenses on flight tickets. 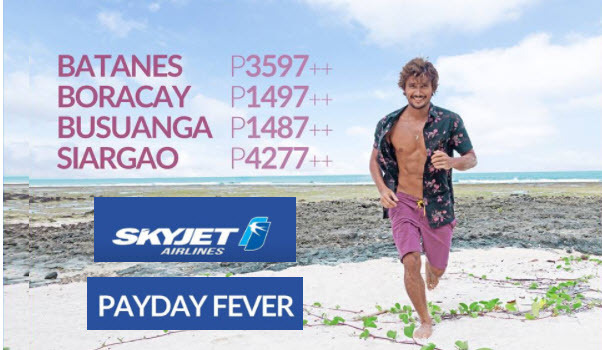 Avail Skyjet sale tickets from their ongoing Payday Fever seat sale. Skyjet promo fares can be booked from September 14- 17, 2017. Get the low fares by logging on to the airline website at www.flyskyjetair.com. Sale tickets can be used for trips from September 15 until December 31, 2017, except embargo dates. Tickets are good for one-way trip Manila to/ from Batanes, Boracay, Busuanga or Siargao. Fares are inclusive of VAT, but do not include Aviation Security Fee (ASF) and Domestic Passenger Service Charge (DPSC). Skyjet sale tickets cover 5 kilos hand carry bag and checked baggage of 10 kilos (for adults) and 5 kilos (for children). Promo fares are non-refundable, non-rebookable, non-transferable, non-endorsable and non-commissionable. Want to get updates on new Skyjet and other airlines promos? Like and Follow us in Facebook PISO FARE TICKET for the latest info on Cebu Pacific, Air Asia, Philippine Airlines promo fares, PISO FARE promos 2017- 2018!